69% of all e-commerce visitors abandon their shopping cart. Why? At Baymard we’ve tracked the global average cart abandonment rate for 9 years, and it currently sits at 69.2%. After e-commerce sites have invested vast resources in “first in mind” strategies, Pay Per Click campaigns, beautifully crafted homepage imagery, perfect category taxonomies, faceted search logic, etc., it seems almost unbearable that 69% of users – after having added items to their cart – then choose to abandon their purchase. Why is it that this many orders are abandoned? And what exactly can online retailers do to improve this sad state of affairs? That’s exactly what we wanted to find out. At Baymard Institute, we started researching checkout usability more than 9 years ago when we founded the institute and did our first round of large-scale usability testing. Ever since, we’ve tested and re-tested checkout usability, running large-scale qualitative research studies testing the checkout flows of the world’s leading e-commerce sites, as well as conducting checkout UX audits for more than 100 leading e-commerce sites. This page provides you an overview of the results from those years of testing checkout flows with real end-users. During all 9 years of usability testing we have consistently found the design and flow of the checkout to frequently be the sole cause for users abandoning their purchase during the checkout flow. Either because users become so infuriated that they leave in anger, or because they don’t know how to complete one or more fields, and thus have no other option but to leave. 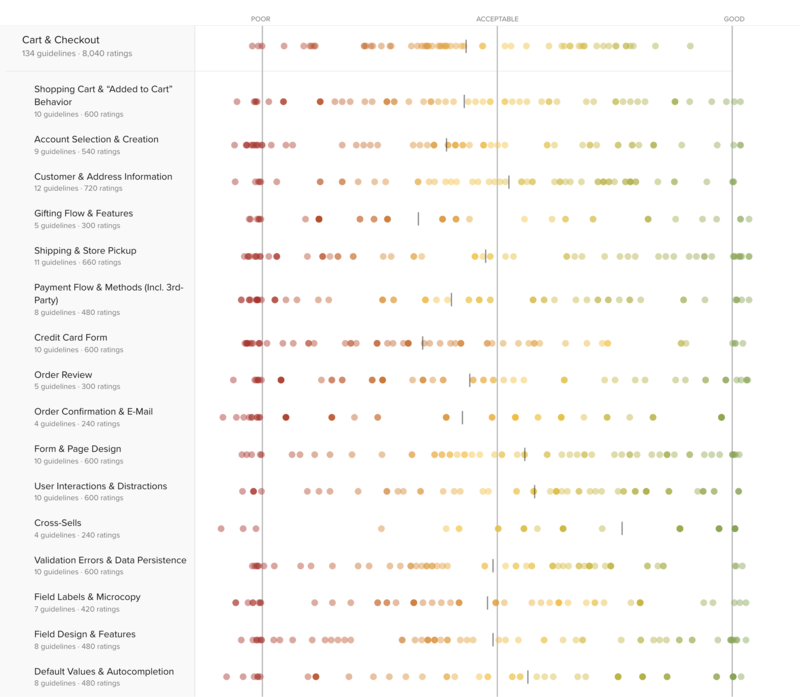 To accompany the usability test sessions we’ve also benchmarked the checkout flows of 60 top grossing US and EU e-commerce sites across all 134 guidelines, each on a 7 point weighted scale. This has resulted in a benchmark database with 7,800 checkout elements manually reviewed and scored, across 440 different checkout steps. When looking at the general state of checkout usability, the average performance is “mediocre”. The average site has 39 unique improvements to perform in their checkout flow, to gain the 35.26% increase in conversion rate our combined usability test sessions show that the average large-scale e-commerce site can potentially improve through better checkout UX. However, the nuances and diversities behind the overall mediocre performance are manyfold. Explore design patterns across 525 examples of checkout step designs and features, all annotated and organized into 11 different categories. This is a great way to get inspiration for your own checkout flow, and to get a feel for emerging trends in checkout design. Card number patterns – a reference table of numerous different credit card patterns, outlining the IIN-range and spacing-schema. The UX benefits and inherent usability pitfalls of a multistep checkout flow, accordion checkouts, and one-step checkouts. The shopping cart page, incl. cart design, quantity and save features, the page response when users add products to the cart on the product page (drop-down cart, etc.). Checkout flows for signed in users, users creating an account, or checking out as a guest, incl. account-selection designs and communication,‘Delayed Account Creation’, social media accounts, password rules. How to handle the form fields for all personal user data, incl. privacy concerns, shipping addresses, billing addresses, international addresses, phone fields, address auto-detection techniques, etc. How the checkout flow and fields need to change when users gift-mark items, where and how users should be able to gift-mark items, and how the actual gifting features needs to be presented to avoid issues. Shipping and store pickup, incl. the shipping method UI, shipping descriptions, order cut-off times, ‘Free Shipping’ tiers, how omni-channel sites best integrate ‘Store Pickup’ and ‘Store Availability’, and more. The payment methods interface, how to integrate and display an array of different third-party payment methods, the gift card redemption flow, and more. How to cause as few abandonments as possible, incl. the credit card field design, card validation logic and formatting, expiration date, security code, and cardholder name inputs, field sequence, card icons, and card type selection. How to properly design the final ‘Review’ step before a user completes an order, including ‘Place Order’ button placement, and necessary review data, along with the editing flow for those users who need to change data. 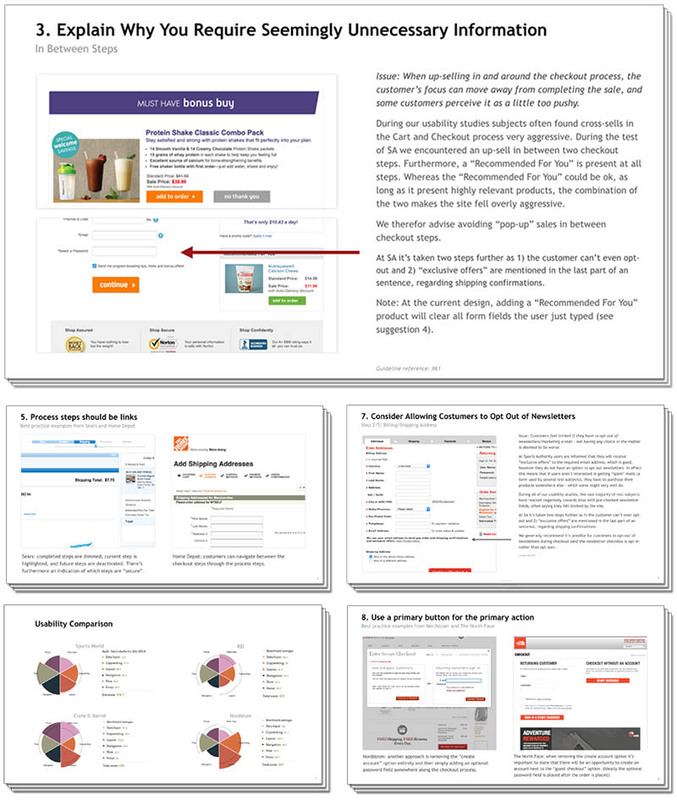 The implementation of post-purchase confirmations, incl. the information and actions needed on the order confirmation page and order confirmation email. How to design and position the cart link in the site wide header and primary button throughout the checkout, minimizing form intimidation, avoiding multi-column layouts, using ‘Enclosed Checkout’ designs, etc. How to implement load indicators, when to provide feedback on user actions, where to avoid ‘Apply’ buttons, embedding content from third-parties, and much more on interactive components. How to thoughtfully incorporate cross-sells into a checkout flow, including the use of active vs. passive cross-selling, adapting cross-sells to user context, and pitfalls of specific placements and wording. Error recovery and address validation experiences, incl. how to improve users’ ability to locate, understand, and resolve errors, and more. How to mark optional and required fields, appropriate label positions, inline labels, optimizing microcopy and descriptions, and marking of optional and required fields. The proper selection and assembly of form elements, inputs, and selections, incl. choosing the right type of interface, field masking and character restrictions, and more. Intelligent form features such as making inferred selections, prefilling form fields, browser auto-fills, and personalization of the checkout flow — smart form field features that improve checkout UX substantially. 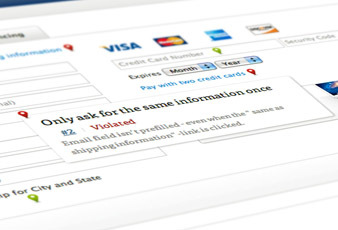 What are the 15 most important changes you can make to your checkout process? 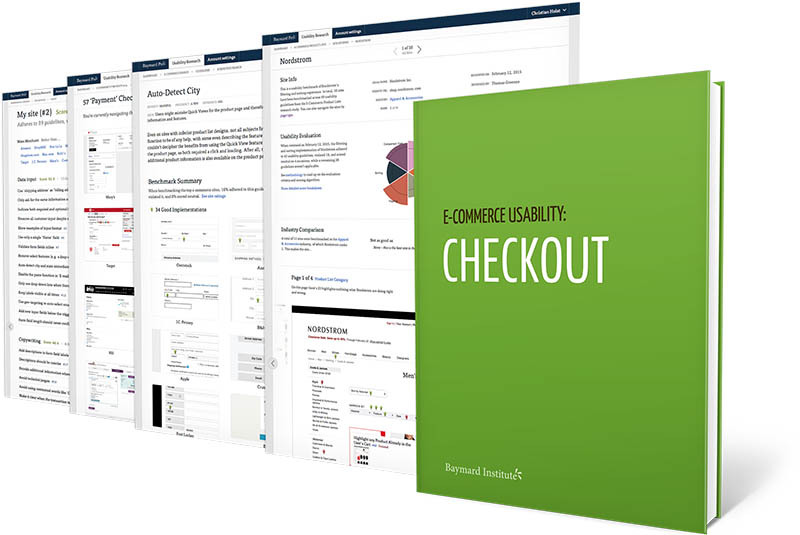 We will put together a 40-page report of the 15 most important usability improvements you can make to your checkout process. Usability Testing: 7 rounds of qualitative usability testing with 1,200+ test subject/site sessions following the “Think Aloud” protocol (in-person 1:1 moderated lab usability testing). 10 rounds of manual benchmarking of the world’s 60 top-grossing e-commerce sites across all 640+ UX guidelines across (27,900+ implementation examples and 50,000+ UX performance scores). 7 quantitative studies with a total of 9,221 participants. Baymard’s research methodology is described in detail here.